Synchronizing your personal and work calendars can be complicated and time-consuming, especially with those notifications on where we are supposed to be and what we are supposed to do. There are times when work or personal matters distract us and worse, can even make us forget an appointment, or only remember that appointment at the last minute with no more time to prepare! Mishaps like these can be avoided with GigaBook – an application that can efficiently organize calendars’ schedules and has several beneficial features, including the GigaSync feature. After you have signed up with GigaBook and set up your account, you can synchronize or sync your account with various digital calendars by using the GigaSync feature. GigaSync helps solve many of the burdens of organizing the various activities of your third-party work and personal calendars. These calendar activities include appointments, conferences and meetings, birthdays, holidays, and special events. The cancelling and rescheduling of any of those activities can be done in a smooth process because of GigaSync’s syncing abilities. GigaSync keeps your daily work and personal life organized. Your GigaBook calendar keeps your business calendar activities updated across all platforms, making sure you are always aware of your business’s goings-on. Your existing third-party calendars and GigaBook calendar can be set up to sync information back and forth between them. The setup process is simple because it only consists of a few steps to connect your GigaBook calendar to third-party calendars. 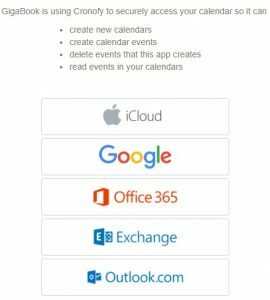 Visit the Calendar Sync Settings Page of your GigaBook account and follow the steps for synchronizing your GigaBook Calendar with third-party calendars such as Outlook, Google Calendar, Office 365, Apple iCal, Office 365 and Microsoft Exchange. What – you can select the specific third-party calendar that you want to sync with your GigaBook calendar. When – you can schedule how often you want to sync your third-party calendars with your GigaBook calendar. How – the GigaBook platform application can be accessed from anywhere on any device. This means you can view the latest updates on your calendars from anywhere you are. Once your GigaBook account is sync with your third-party calendars, you can always stay updated with the schedules of your personal and work calendars. All entries in your GigaBook calendar automatically and immediately reflects in the calendars that are synced with GigaBook. Additionally, when you access any of your digital calendars from any mobile device, all updates you make to a specific calendar is updated in real time to your GigaBook calendar even if you are signed off from GigaBook. 1. Make sure to complete all the steps in the Smart Start setup of your account, including the Calendar Sync. 2. Go to the Dashboard page. Click the Settings Search symbol at the left bottom portion of the page. 3. In the Settings Search box, type in “Sync with third party calendars” to direct you to the GigaSync page. 4. On the Third-Party Calendars section on top of the page, click on the Manage button. 5. The Third-Party Calendar Email Address pop-up window appears. Click on the Link button. 6. 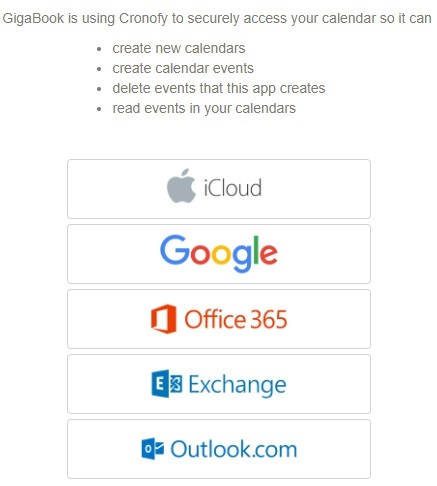 The app.cronofy.com window appears with a list of 3rd-party calendars. Select a calendar. 7. In the next window, click on the Link Account button. The Sign In account window appears. 8. Sign into your account that links to your GigaBook calendar. GigaBook is a cloud-based appointment booking platform designed to help small and medium- sized businesses take appointments through their existing websites. The platform offers an easy and simplified booking process for your business and your clients. GigaBook is a fully customizable platform that you can access anywhere, on any device. GigaBook’s efficient appointment scheduling process eliminates the headaches and hassles in scheduling your appointments. Conflict of schedules, double bookings, and missed appointments are reduced and even eliminated by the platform’s automated process for arranging and organizing appointments. You can use your daily, weekly or monthly calendars to manage your scheduling. 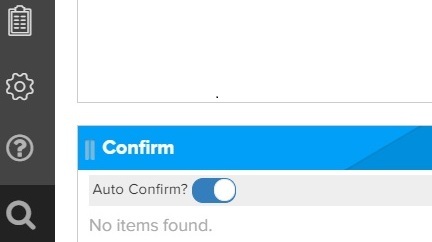 With GigaBook, you can get rid of the “When are you available?” and the “Can we reschedule?” questions. Take advantage of the GigaSync feature of GigaBook now by trying a free, no obligation 14-day trial and see how your business runs more efficiently. Sell More and Spend Less! Get all features available on GigaBook, including our appointment system, team scheduling, to-do lists, project management, invoicing, payment collection, email marketing, business pages and widgets free for 14 days! Just set up your business profile in minutes and you'll be up and running. No credit card or obligation required!